One of the most common complaints I hear about open source projects is around documentation, from the complete lack of documentation to just outdated documentation. There’s many reasons why this is the case, from time to skills but I’m not going to go into that. 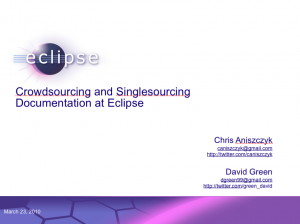 Yesterday at EclipseCon, David Green and I gave a talk about Crowdsourcing and Singlesourcing Documentation at Eclipse and our thoughts on how to solve the documentation problem for Eclipse.org related projects. While the talk is focused on Eclipse.org related projects, there is nothing in there that prevents you from taking what we did and apply it to your own projects, whether or not they are open source. The key lessons here is that most developers don’t like contributing to documentation to begin with. They also never have the time. On top of that, if the barriers to contributing documentation is high, no one will contribute and you’ll end up with low quality documentation. Lower those barriers by enabling a variety of people to contribute documentation, not only people with commit access to the project. If you involve and enable the community to contribute, you may be surprised at what contributions you get. What other experiences have people faced when it comes to open source related documentation? What can make things better?